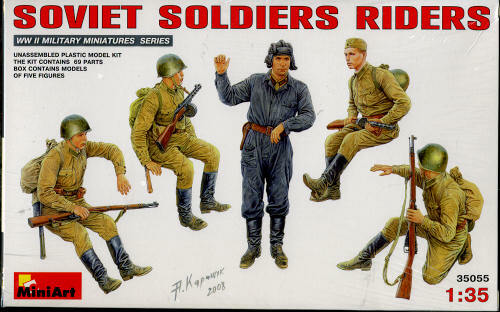 This latest set from MiniArt us for Soviet soldiers riding on a tank of some sort. The set includes five figures. 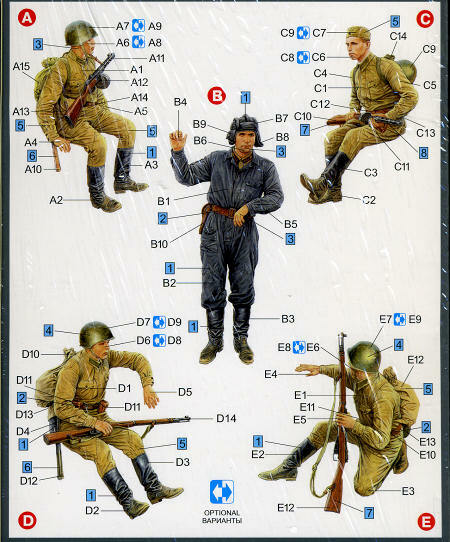 One is a tanker who can be posed standing in the open hatch of what is probably a T-34 with his hand on the hatch itself and looking around the side of it. 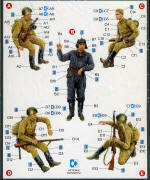 The other four figures are ordinary soldiers in various sitting positions as would be the norm while riding on a tank. They are in a fairly relaxed pose so it would be appropriate to use these in a scene where battle is no imminent. Like all figure sets nowadays, the instructions and painting guide are in one and portrayed on the back of the box. Colors are provided for a number of manufacturers so one is pretty confident and a brand or two will be locally available. I like this sort of thing being already presented as it saves a lot of guesswork. Sets like this are just the ticket to help liven up an armor model and MiniArt's moldings are very good. My thanks to www.dragonmodelsusa.com for the preview set. Get yours today at your local hobby shop or on-line store.